Lawrence Okun of Kenmore, NY has pleaded guilty to Social Security fraud. Okun had used his late brother's identity to work from 1997 to 2005 while drawing Social Security disability benefits, according to the Buffalo News. Jim Burkert reported that the Commissioner and Linda spoke at the dedication of the new Auburn WA teleservice center. There were managers in attendance from all over the region. The Commissioner stated that for every $100 million we lose in budget, it’s an extra 5 days of furlough per employee. The funding level recommended by the Senate Appropriations Committee looks like it would result in a 10-day furlough. The Commissioner also stated that the entire Agency would be furloughed at one time and mentioned the possibly of closing all offices (1) day a month rather than a straight 10-day furlough. This would allow the Agency to save on heat, guard service, etc. She stated that the Agency can’t cut everything else just to avoid furloughs. The Agency will look very closely at what makes the best sense to cut. The Commissioner also talked about conducting a pilot to close 30 offices (1) day a week. The purpose is to determine if the Agency gains productivity by enabling offices uninterrupted time to process work. The 2006 edition of my book, Social Security Disability Practice, is now available for purchase from the West Group. Beyond the usual updating, the new edition includes lists of common medical abbreviations and acronyms for the 61 medical conditions most commonly encountered in Social Security disability claims. According to a Social Security Press Office Fact Sheet Jo Anne Barnhart's term as Commissioner of Social Security expires on January 19, 2007. With the end of her term so near it is not surprising that rumors have already started about her future. There was a report at one time that Barnhart hoped for another term as Commissioner. It is unclear whether she still is interested or if the President is interested. Barnhart's support for the President's Social Security "reform" proposal was half-hearted at best. It is unclear whether Barnhart, or anyone else appointed by President Bush, could be confirmed as Commissioner. The Commissioner has a six year term. This takes the next Commissioner through the entire term of the next president. Democrats may wish to prevent anyone appointed by Bush from being confirmed so that the next president can appoint his or her own man or woman to the job. There is an easy pretext for blocking confirmation. It seems obvious that Bush will appoint someone who supports his ideas for Social Security "reform", which Democrats call privatization. Even Barnhart publically supported Bush's plan to some extent. Although the Commissioner of Social Security has little role in this debate -- and, indeed, the debate is over for all practical purposes -- Democrats can easily seize upon this as grounds for refusing to confirm someone appointed by Bush. Regardless of whom the President nominates for Commissioner of Social Security, there will be an Acting Commissioner after January 19, 2007 for a period of at least a few months in 2007, since it will take that long for the Senate to act upon a nomination. That person could end up being Acting Commissioner for two years or more if no one appointed by President Bush can be confirmed as Commissioner. Larry Dye, Chief of Staff, has worked in government and politics since 1971. His federal service includes more than 15 years on Capitol Hill. He has worked on both the House and Senate side of the Hill in a variety of capacities, including research assistant, executive assistant, professional committee staff, budget analyst and chief of staff. In the political realm, he has worked on a variety of campaigns. Larry is a sixth-generation Kentuckian and graduated from Centre College of Kentucky. He also was an Eagleton Fellow at Rutgers University before moving to Washington, D.C., to begin his first job at the Republican National Committee. The important thing about this is that Dye is not a career Social Security employee. He is a long time Republican operative. Martin Kranitz of Annapolis, MD, who has done contract work for Social Security as a vocational expert witness, has sent out a press release promoting a video to help disability claimants prepare for hearings before Social Security Administrative Law Judges. The video is available for $37.95. Video clips are available online. Social Security has issued its monthly statistical packages for Title II and Title XVI of the Social Security Act. 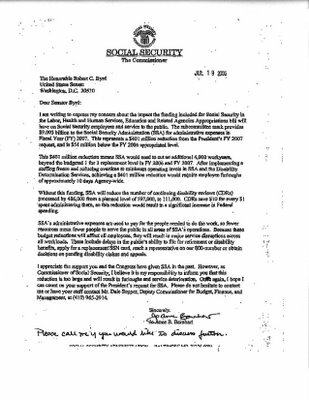 According to a Senate Appropriations Committee summary Social Security's budget for fiscal year (FY) 2007, which begins on October 1, 2006, has already been reported out of committee in both the House of Representatives and the Senate. Social Security's budget is part of the Labor/HHS/Education Appropriation bill It has not yet come up on the floor in either house of Congress. Here is the portion of the Senate Appropriations Committee Report dealing with Social Security. 1 Excludes $38,000,000 in emergency supplemental appropriations enacted pursuant to Public Law 109-234. The 2007 budget estimate is the amount recommended by the President. The House of Representatives cut that dramatically and the Senate is threatening to cut it even further. The Committee encourages SSA officials to educate adjudicators at all levels about the functional impact of CFS and the application of the April 1999 CFS ruling (99-2p) to ensure that adjudicators remain up to date on the evaluation of disability that results from this condition. The Committee encourages SSA to examine obstacles to benefits for persons with CFS and to keep medical information updated throughout all levels of the application and review process. I am writing to express my concern about the impact the funding included for Social Security in the Labor, Health and Human Services, Education and Related Agencies Appropriations bill will have on Social Security employees and service to the public. The subcommittee mark provides $9.093 billion to the Social Security Administration (SSA) for administrative expenses in Fiscal Year (FY) 2007. This represents a $401 million reduction from the President's FY 2007 request and is $54 million belowe the FY 2006 appropriation level. This $401 million reduction means SSA would need to cut an additional 4,000 workyears beyond the budgeted 1 for 3 replacement level in FY 2006 and FY 2007. After implementing a staffing freeze and reducing overtime to minimum operating levels in SSA and the Disability Determination Services, achieving a $401 million reduction would require employee furloughs of approximately 10 days Agency-wide. Without this funding, SSA will reduce the number of continuing disability reviews (CDRs) processed by 486,000 from a planned level of 597,000 to 111,000. CDRs save $10 for every $1 spent administering them, so this reduction would result in a significant increase in Federal spending. SSA's administrative expenses are used to pay for the people needed to do the work, so fewer resources mean fewer people to serve the public in all areas of SSA's operations. Because these budget reductions will affect all employees, they will result in major service disruptions across all workloads. These include delays in the public's ability to file for retirement or disability benefits, apply for a replacement SSN card, reach a representative on our 800-number or obtain decisions on pending disability claims and appeals. I appreciate the support you and Congress have given SSA in the past. However, as Commissioner of Social Security, I believe it is my responsibility to inform you that this reduction is too large and will result in furloughs and service reductions. Once again, I hope I can count on your support for the President's request for SSA. Please do not desitate to contact me or have your staff contact Mr. Dale Sopper, Deputy Commissioner for Budget, Finance and Management at (410) 965-2914. Social Security's Office of Inspector General (OIG) has issued its Summer 2006 newsletter, which contains, among other things, accounts of several criminal convictions for Social Security fraud that OIG obtained. What this shows is that Social Security employment has remained relatively constant -- in the face of what is almost certainly the largest increase in the agency's workload since the 1930s, as baby boomers age into their prime years for disability claims. Disability claims are only a small fraction of the benefits paid by Social Security but account for more than half of Social Security's workload. Provides expert medical policy, procedural, and technical advice and guidance to DDSs, ROs, ALJs, the DRB, OQP and the national network of experts affiliated with the OMVE on the most complex issues encountered in making the determination or decision in a disability claim. This technical advice and guidance includes confirming what medical, psychological and vocational expertise is needed as well as verifying the need for additional medical or lay evidence, tests, or a consultative examination. Verifies that the request is in accordance with disability law, regulations, and policy. Serves as a medical program expert and technical authority by providing technical advice on medical disability program issues, concerns, initiatives and requirements. Provides oral and written reports and conducts briefings on behalf of the Director to other SSA central office and regional components. Provides expert medical advice and guidance for cases with multiple impairments to the DDSs, ROs, ALJs, DRB, OQP and the national network of medical and vocational experts. This job description does not suggest that the Nurse Case Managers will have any direct contact with claimants, but it does suggest that the Nurse Case Managers may play something of an advocate's role in the process. They could be present at ALJ hearings, by video, to explain why the prior decision denying the claim was right. Still, the job description raises as many questions as it answers. There is a worrisome history behind the idea of "case management" in the Social Security disability programs. The first recommendation that Social Security ought to have case managers that I can find came from Patricia Owens, formerly head of the Office of Disability Operations at Social Security and more recently an advisor to UNUM, the nation's largest Long Term Disability (LTD) insurer. She was pushing "case management" in 1999 in testimony to the House Social Security Subcommittee and she clearly had in mind people who would find a way to get claimants back to work, or at least off Social Security disability benefits. The General Accounting Office, now the Government Accountability Office (GAO), picked up on this. The GAO testified, approvingly, in 2000 to the House Social Security Subcommittee about the practices of private long term disability insurance companies who were using nurse claim managers, among other personnel, to "encourage" recipients of long term disability (LTD) benefits under employee pension plans or under private insurance plans to return to work. GAO rehashed much the same subject in an early 2001 report. In 2002, in a report on disability determination at both Social Security and VA, GAO again urged "case management." None of the GAO reports acknowledged that the return to work "encouragement" was often perceived by the LTD recipients as harrassment aimed at lowering resistance to termination of benefits or that, in general, the insurance companies' handling of LTD claims has been extremely controversial in recent years. Social Security has released monthly statistics on fees paid to attorneys and others for representing claimants before the agency. The fees come out of the back benefits of the claimants. Fee payments fell by 24% in July, 2006 as compared to June, 2006 and fell by 14% as compared to July 2005. The Social Security Section of the State Bar of Michigan has issued its Summer 2006 newsletter. What may come as a surprise to attorneys in other states is that the Grand Rapids Hearing Office still copies Social Security files for attorneys who have hearings with that office. Much of her career appears to have been shaped by her service to [former Republican Senator from Delaware] Roth, a former Senate Finance Committee chairman, for whom she worked off and on in several capacities since shortly after graduating from the University of Delaware in 1975. Through the course of five Roth re-election campaigns and various stints on Roth's Senate staff, she developed into a fiercely protective senior adviser to the veteran lawmaker. She served him much as presidential counselor Karen Hughes serves President Bush, as chief spokesman and gatekeeper as well as a top tactician and alter-ego. "She was intensely loyal to Roth and fiercely committed to [his] cause," said Brian Selander, press secretary to Delaware Democrat Thomas R. Carper, who defeated Roth last year in his bid for a sixth term at age 79. Celia Cohen, a political writer who has covered Delaware politics for 20 years, called Barnhart "relentless." The Roth campaign "was known as 'The Thrasher' because they just ground [rival candidates] up," said Cohen. "Jo Anne is very much a control person - nothing escaped her notice." During the 1988 campaign, Cohen said, Barnhart was nine months pregnant with her son, Niles, and on the campaign trail full time. She left on a Friday, Cohen recalled, gave birth over the weekend and was in campaign headquarters directing traffic - with a days-old infant at her side - by Tuesday. The lawsuit filed in the District of Columbia by Public Citizen claiming that the Deficit Reduction Act was unconstitutional because it was not passed in the same form by both houses of Congress has been dismissed. Among many other things, the Deficit Reduction Act made changes in the payment of back SSI benefits. The matter will now head to the Court of Appeals. Social Security has announced that appeals may now be filed by telephone. This is a significant step forward. In the past many claimants thought they had filed an appeal when they talked with Social Security on the telephone and were then shocked to discover that nothing happened on the appeal they thought they had filed -- because the telephone conversation was not an appeal, but merely a request for appeal forms that might or might not ever arrive, or which the claimant might or might not ever complete and return. This is effective immediately, although it is doubtful that many Social Security employees have been notified. There are so many myths circulating on the internet concerning Social Security that the Social Security Administration has had to post information to try to set the record straight -- and the debunking has gone from one world wide web page to a second page. Snopes, a private service, also had one page and now a second page debunking these myths. All of these myths have a strongly anti-Social Security bias. Social Security must be putting out press releases designed for smaller newspapers to run as articles. This one is a quiz about Social Security designed for the lay public. The Norman Transcript just ran it. This sort of thing is harmless, but one has to wonder about the expenditure of funds on such a project when the Commissioner of Social Security is threatening to furlough employees due to lack of operating funds. In honor of the 50th anniversary of the creation of the first Social Security disability program, Social Security's Office of Policy has produced an excellent statistical report on Social Security's disability programs. This is probably the best single statistical report on Social Security's disability programs that I have seen in more than 27 years or reading such reports. It is worthy of study by policymakers, by all SSA employees, by all Social Security disability benefits recipients and by all attorneys who represent Social Security disability claimants. The Bush administration has begun sounding out lawmakers and other key figures about mounting a new bipartisan effort to rein in the costs of Medicare, Medicaid and Social Security after the midterm elections, according to officials in the administration and on Capitol Hill. The Post reports that Bush "appears fixated on the issue." ... said he can envision no circumstance in which Bush could secure any overhaul of the Social Security program, including creating personal accounts. "The Democrats cannot be bribed, cajoled or threatened into voting for Social Security reform -- it can't happen," he said. Current regulations at 20 CFR 404.906 and 416.1406 authorize us to test, individually, or in any combination, different modifications to thedisability determination procedures. We have conducted several tests under the authority of these rules, including a prototype that incorporates a number of modifications to the disability determination procedures that the DDSs use. The prototype included three redesign features, and we previously extended the tests of two of those features: the use of a single decisionmaker, in which a disability examiner may make the initial disability determination in most cases without requiring the signature of a medical consultant; and elimination of the reconsideration level of review. We are extending the testing of the two redesign features of the disability prototype. In conducting a blog search on the web, I noticed that you initiated one on our new Electronic Records Express initiative. As the lead for marketing on this initiative, I wanted to let you know that the Electronic Records Express website is up now, the website is www.socialsecurity.gov/ere. I thought you might want to update the blog with this information. If you need any additional information please contact me. Today's Federal Register contains Social Security Ruling 06-03p, concerning opinion evidence from what Social Security terms "not acceptable" medical sources, such as nurse practitioners, physician assistants, licensed clinical social workers, naturopaths, chiropractors, audiologists, therapists and teachers, used in determining disability. The Ruling indicates that opinions from such sources can be valuable evidence, which might outweigh the opinion of an "acceptable" medical source in certain circumstances. This Ruling may be especially useful in disability claims where the claimant has been seeing primarily a nurse practicioner, physician assistant or mental health therapist. The Social Security Administration has amended its regulations on SSI income and resources based upon the Social Security Protection Act of 2004. The changes are non-controversial. Social Security has filed a new ruling to be published in the Federal Register tomorrow, which might be significant. The text is not yet available. Here is the description from the Office of Federal Register. Social Security has posted a new job announcement for Federal Reviewing Officers (FEDROs). The announcement indicates only that there are "many vacancies." The Daily Iberian reports that Louis Wilkerson of New Iberia, LA pleaded guilty to Social Security fraud for failing to report that he was working while drawing Social Security disability benefits. Social Security's Office of Policy has published its International Update for July, 2006. The Update gives information about Social Security developments in other countries. The National Association of Disability Examiners (NADE), an association of disability examiners who work for state disability determination agencies, has released its Summer 2006 Newsletter. The Newsletter contains a good deal of detail about the Disability Service Improvement (DSI) experiment. USA Today reports that Social Security's Chief Actuary, Stephen Goss, has come out against accrual accounting for Social Security. Under accrual accounting Social Security's future obligations would have to be shown on government accounting reports, much as private corporations include their own future obligations to their retirees in their financial reports. Some accountants are recommending accrual accounting for Social Security. Part of this may simply a desire for higher accounting standards, but others seem to have an ulterior motive of making Social Security seem dangerously unstable. 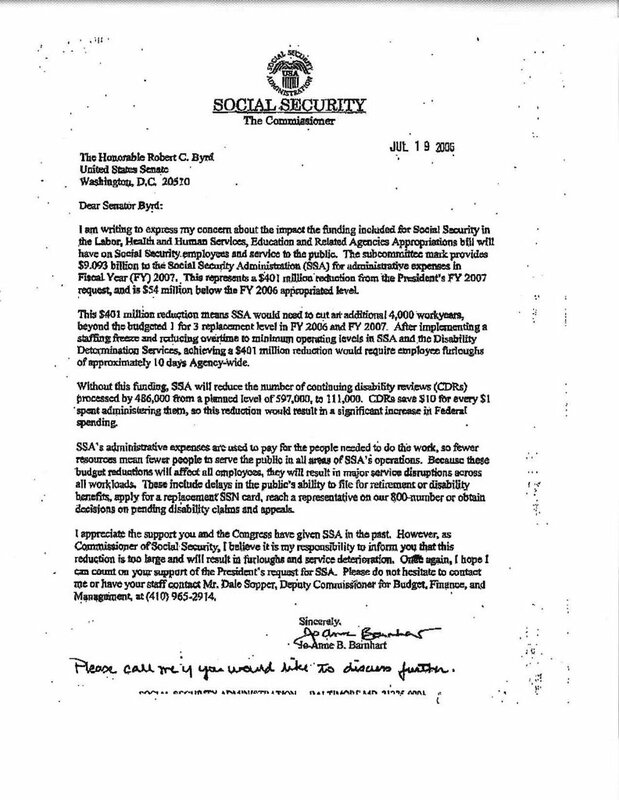 The Bush Administration opposes accrual accounting for Social Security. The National Association of Disability Representatives (NADR) has released its Summer 2006 Newsletter. Each of these current listings, except current listing 14.09D [for AIDS], also requires you to have all four of the constitutional symptoms or signs: Severe fatigue, fever, malaise, and involuntary weight loss. We propose to revise this requirement to ‘‘at least two’’ of the constitutional symptoms or signs instead of all four, because we believe that the requirement in the current listing is too severe. Your symptoms, including pain, fatigue, and malaise, may be important factors in our determination whether your immune system disorder(s) meets or medically equals a listing or in our determination whether you are otherwise able to work. In order for us to consider your symptoms, you must have medical signs or laboratory findings showing the existence of a medically determinable impairment(s) that could reasonably be expected to produce the symptoms. A Middlesboro, KY woman has been sentenced to six months of home detention and three years of probation for SSI fraud. She had concealed the fact that her boyfriend was living with her and that they owned more than one vehicle. There must be more to the story than is revealed in the Middlesboro Daily News, since on its face, a boyfriend living in the home of an SSI recipient would not necessarily be fraud. • August 1, 2006: DSI begins. • Early September 2006: Initial cadre of FedROs are ready to accept cases; the Medical and Vocational Expert System (MVES) is ready to accept cases. • Early December 2006: ODAR hearing offices and the Decision Review Board (DRB) are ready to accept cases. • Early 2007: Cases start arriving at hearing offices and DRB in larger numbers. SSA is hiring 70 FedROs; about 15-20 support staff; and 7 supervisory ROs, who will all be located in Falls Church, VA, at ODAR headquarters to facilitate close monitoring during the initial DSI implementation. Eventually, they may be located in other areas of the country. To distinguish the FedROs from the ALJ hearing process, there is a separate ODAR Associate Commissioner for FedROs. The current Acting Associate Commissioner is Jim Winn. FedROs will receive eight weeks of training, starting in August; support staff will receive two weeks. The Newsletter reveals that SSA plans to tell the claimant and their attorney in an acknowledgment letter the name and contact information for the Federal Reviewing Officer assigned to the case. The Medical and Vocational Expert System—MVES – will be the new way that medical and vocational expertise is sought by adjudicators. As explained by Martin Gerry, the FedRO “may” obtain a medical expert (ME) or vocational expert (VE) for a case from the MVES. The FedRO is “required” to contact the MVES if new evidence is submitted or he or she intends to change the DDS decision. He stressed that the FedRO will “consult” with the MVES and is not required to follow the MVES expert’s opinion. ALJs who want an ME or VE will be required to go through the MVES. How will expert requests be handled? SSA provided this example. The FedRO gets case with new evidence. The FedRO contacts the MVES to “consult” and get medical advice. The case will be assigned to a nurse case manager (NCM), a new position. While most will be in units for different body systems, there will be some who can deal with multiple impairments. The NCM will identify the problem and then refer the case to an appropriate expert in the MVES. With the electronic folder, it will be easy for the expert to access the folder. Who are the experts? Initially, doctors in the Federal DDS will form the core of the MVES. SSA is working with Johns Hopkins Hospital in Baltimore, MD, to provide the rest of the expertise. As examples of MEs who will be available nationally, Mr. Gerry mentioned specialists in autoimmune diseases, Lou Gehrig’s disease (ALS), and claimants who are chronically homeless. For VEs, current lists will be used until national qualifications are established. Who will conduct CEs? SSA is preparing a request for proposal to medical professionals in Region I, primarily in academic medical institutions, who will be paid the “going rate” to perform CEs. SSA understands the need for local access and is looking at these major medical institutions because they generally have clinical networks in a number of locations. Despite the description of the duties of the Nurse Case Managers, I would suggest watching this carefully. The number of Nurse Case Managers being hired just for Region I, 90, plus the job title suggests that some additional duties are being planned for the Nurse Case Managers. The Newsletter says that "SSA headquarters will provide the Field Offices with DSI instructions on August 1st, but a public version of instructions will not be available for one to two months." MarketWatch reports that Henry Paulson, in his first speech as Secretary of the Treasury, spoke of his desire to make progress towards President Bush's goal of "reforming" Social Security with private accounts. Social Security regulations give some weight to a claimant's illiteracy in determining disability. It may surprise some just how common illiteracy is. A 2003 study by The National Center for Education Statistics found that 14% of adults have below basic skills in reading prose. One would expect this group to be greatly overrepresented among disability benefits applicants. Social Security's Disability Service Improvement (DSI) experiment is officially under way today in Social Security's Region I, the Boston Region. However, the central part of DSI, the Reviewing Officer (RO) position is far from ready for business. The reports are that the first ROs will not report for duty for another week and will then begin two months of training. It is also unclear whether other parts of DSI, such as the "quick disability determination" process, the Medical-Vocational Expert System or the Decision Review Board are even as far along as the ROs. Social Security Administrative Law Judges (ALJs) have frequently been criticized for inconsistency. Some Social Security ALJs approve 90% or more of the disability claims they hear. Others approve less than 20%. A report on the Cox News Service shows that this sort of inconsistency is not just a Social Security problem. Immigration judges making decisions on applications for asylum show a similar pattern of inconsistency, with one immigration judge approving 90% of asylum applications while another approves only 3%. One interesting aspect of this report is that the Office of Immigration Review released the data in a manner which shows what each judge did, by name. Social Security has released similar data, but refused to identify ALJs by name. Social Security has put out a news release marking the 50th anniversary of disability insurance benefits this month. The Herald Star Online has published the news release.